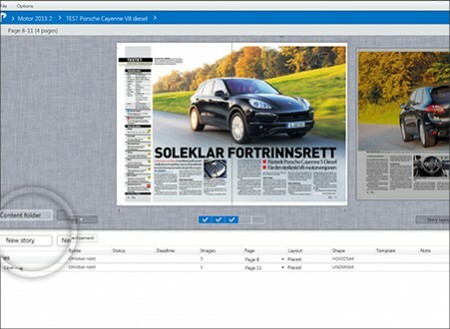 The combination of content portal, an intuitive user interface, use of templates, Adobe InDesign integration and a rich text editor altogether makes PagePlanner the ultimate content production tool for Print and Web. Writers easily add their own stories, designers make fantastic layouts and editors ensure that the results are just what they were looking for. Administrate and work with your internal staff and your external content contributors using the Content Portal. The communication and writing of stories are done easily in the web browser - its simply a smooth way to collaborate and asign stories to all your contributors. Tasks can be dedicated a specific person and when its written its automaticially placed in the flatplan. The editors get a easy workflow and obtain an extremely good overview. The Content Portal includes a full write-to-fit functionality (w/overflow). 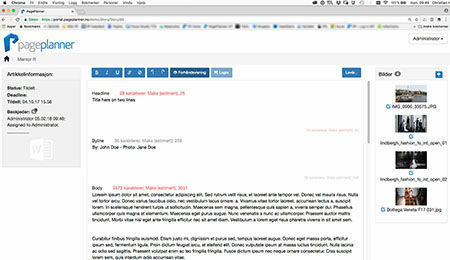 The dynamic flatplanning tool provides fast navigation and a total overview of one or many productions on one screen. 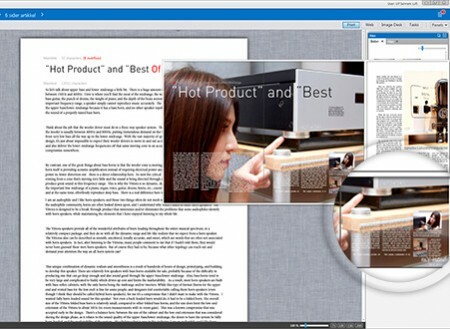 Move, add, edit, copy or delete articles, pages or sections with ease, even right before a deadline. 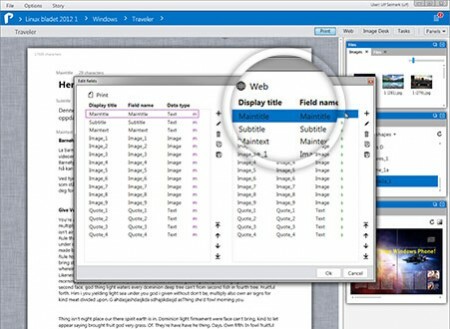 Plan and change layouts using drag and drop and have page numbers update automatically. See where space is available and plan your ads placements more easily. Traditionally, designers use Adobe InDesign while content writers use word processing software. This is not the case in PagePlanner. With PagePlanner’s fast and powerful text editor, everyone can enter, store and change text for multiple channels directly into layouts in Adobe InDesign. 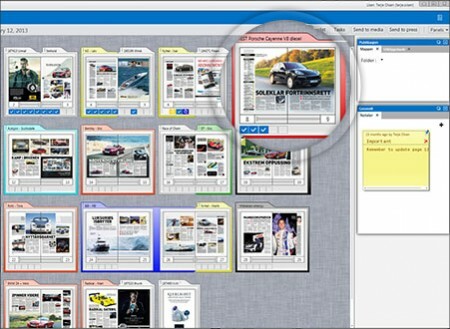 This helps design and editorial teams work faster, in parallel, with complete control over their productions. Maximise productivity and collaboration between your editorial and design teams while maintaining full creative freedom. Change or redesign layouts with Adobe InDesign from directly within PagePlanner so you get the best of both worlds with one easy interface. All changes are automatically stored and synchronised on both servers so you always have the latest versions. Avoid the confusion of sorting through emails and sending large files. 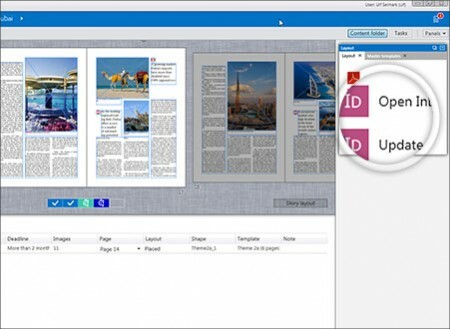 PagePlanner lets you search, find, store and save content in a central place so you always have the files you need on hand. Automatic synchronisation with the Adobe server means all updates in PagePlanner will be stored regardless of which tool you use. With PagePlanner you can quickly adapt, send and preview content for publishing across channels. To save time, you can reuse and repurpose content for both print, web and digital issues. PagePlanner is specifically designed to support end-to-end publishing solutions based on your requirements. It is easily integrated with advertising systems, image management systems, digital asset management systems (DAM), and web content management systems (CMS) so you can automate processes and leverage your assets across platforms. Tell us what systems you use and we will provide complete details.